Platform #2 Is Nested In The Banana Grove Giving You A View Across The Tops Of The Trees. Bring your tent and enjoy 1 week of wild camping. 1 camper $35/day and $180/week. Meals, Hikes, Transportation are extra. We have open air facilities. There are no closed wall cabins on this reserve. Pitch your Tent on the Pavilion - Camp in the wild but stay dry on our raised platforms that protect you from the rain with a tin roof. 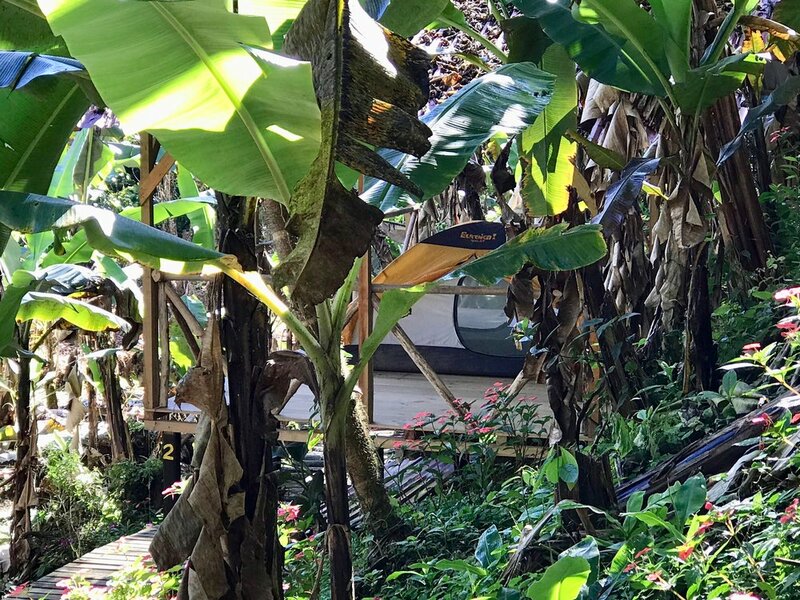 We have 4 Pavilions which are open air, meaning no walls; they have a raised wooden floor; and a tin roof to help keep the tents dry…as it REALLY RAINS in the rainforest! Pavilion #1, #2, and #3 can each sleep 4 people. The platforms can each hold 2 smaller 2 man tents. Tents should be about 6’ x 6’ or 1.8m x1.8m. Total 12 campers. Pavilion #4 can hold a larger tent that can sleep 3 people. The size is about 8’ or 2.4m. Campsite #5 is grass camping with a Tin Roof. This site is the same size as #4 and can hold a larger tent that can sleep 3 or hold a family with 2 small children. The size of the tent is about 8’ or 2.4m. The Total number of campers with a roof that we can accommodate is 18. The Total number of wild grass campers that we can accommodate is 18. That is 2 campers per Tent, and 9 campsites. You can bring Tarps for rain protection. These sites do not have a Tin Roof. We prepare meals for you on M.W.F. The menu is built around the traditional food of Costa Rica, rice and beans. We do not have refrigeration, we serve no meat, but we have lots of fruits and vegetables on hand. Campers use our kitchen facilities to cook their own meals on the days when we don't cook. Bring your own comfort food and camp meals for 3 days. When you are sitting outside to eat it is warm in the daytime and chilly after dark. Water - You’ll be drinking delicious, Costa Rican Spring Water. If you prefer bottled water you must bring your own. Shower - You can stay clean in a sparkling cold private shower or jump into our rushing river for a cool wake up! Composting Toilet - is in a garden of flowers…our Bamboo Out House is about as pleasant as an out house can be! Solar Panel - Basically there is no electricity, however, when the sun shines you can recharge your phone for taking more pictures with our single small solar panel. There is no internet service. Activities - Guided and unguided hikes, camping, bird watching, relaxing, rural Tico culture and indigenous culture, candle lit evenings, riverside fun, cool climate, Saturday Market, and possible horseback riding. The hikes take you on trails on the Reserve and around the local area to secret waterfalls and swimming holes you can only find with a guide. Laundry - Wash your clothes in the main house. A kitchen sink serves many purposes. The original kitchen has been taken back by the jungle. This year campers are using the kitchen in the main house (David's House). February and March have the best weather so we plan to only be open in those two months.